This is a metal powder bed fusion technology that uses a high powered laser to fuse metallic powders together to create functional precision “near net” 3-dimensional parts. The process is digitally driven, direct from sliced 3D CAD data. For each slice of CAD data a thin even layer of fine metal powder is deposited across the build plate, where this selected area is then precisely melted by the laser. This process repeats, layer by layer, until a 3-dimensional part is created. 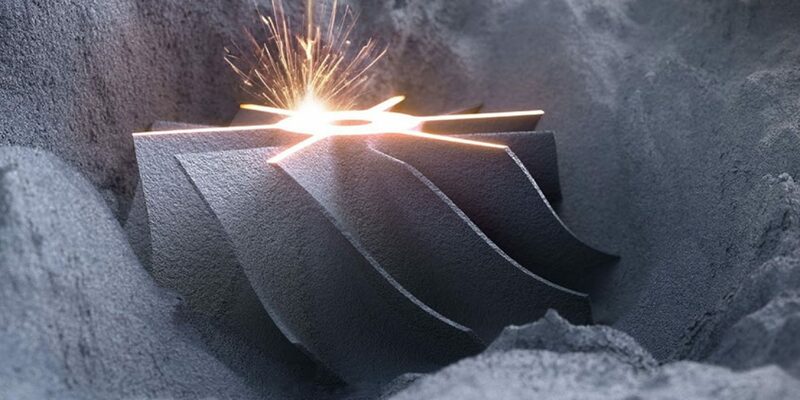 This additive manufacturing process can build in a range of metals, including titanium alloy Ti6Al4V, cobalt chromium, stainless steel, nickel alloys Inconel 625 and Inconel 718 and aluminum alloy AlSi10Mg. Once a part is printed the part is then precision finished via a 5-Axis Milling system to meet any traditional machining requirement that is typical for the demanding customer. This technology can serve all industries including aerospace, automotive, healthcare, consumer goods, etc. Indeed it is the foreseeable game changer technology that is NOW AVAILABLE for 3DE cusomers. Part Consolidation – reducing complex assemblies into single complex parts. Tool Cost Reductions – parts that can now be manufactured directly without tooling. Access Complex Geometry – ability to generate internal inaccessible geometry (i.e. cooling lines, hidden features). Design Freedom – no longer having to adhere to traditional subtractive design strategies – new design rules apply! Weight Reduction Strategies – employing easy weight reduction designs for part optimization. Rapid Design Iterations – ability to leverage quick turn fabrication pathways. Accelerated MFG – via this additive process a true manufacturing process can be identified to reduce time to market and related costs.